There are tons of great cocktail apps. Problem is, most of us don't have access to a bar full of ingredients at home, meaning many of the recipes are useless. 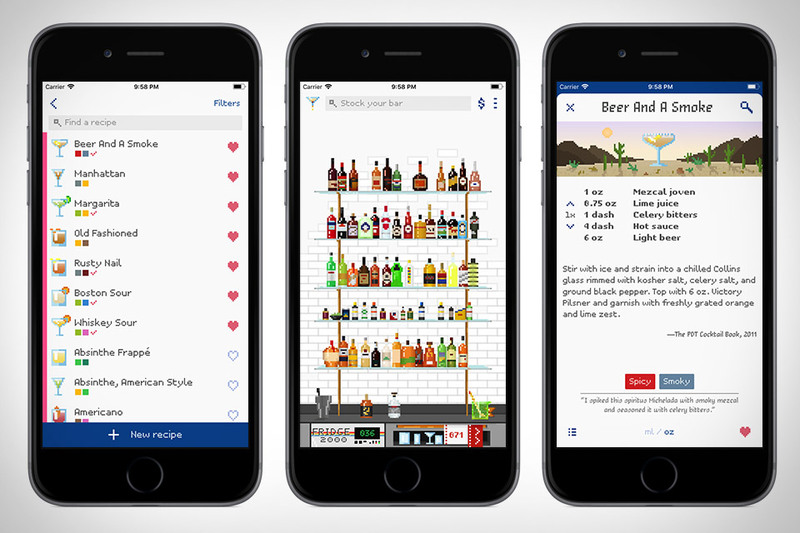 Mixel lets you add the ingredients you own to your in-app bar, then shows you drinks you can make using the stuff you already have. It offers over 700 curated recipes in all, a database of over 500 ingredients, and the ability to add your own recipes to your list of favorites. Based on the idea that a tech-driven brokerage could operate with less overhead, Robinhood was among the first online brokerages to charge zero commissions for self-directed individual or joint stock trades. Following several years of reliable service, it's expanding into the hottest sector in finance: cryptocurrency. Soon, you will be able to buy Bitcoin and Ethereum in the same place as your shares, with support for other currencies on the way. Just like stocks, cryptocurrency trading will be available without a fee, with estimated prices and order "collars" keeping things stable during wild fluctuations in price. Available for iOS and Android, with a web-based app coming soon. FOMO never kicks in quite as bad as when you're staring down a device that's about to die. Die With Me is a new app/media artwork that acts as a group therapy session, dropping you into a chatroom with other poor souls whose phones have dropped to 5%... or lower. It's a humorous look at our modern insecurities, and a novel way to pass those fleeting moments before you have to turn your attention back to the real world. Dubbed an "appsperiment" by the minds in Mountain View, Google Scrubbies is a new research-driven app that lets you remix your video, DJ style. Just tap to record, use one finger to review, and then use a two-finger swipe to record, rewinding and replaying to create your ideal mix. It's joined by Storyboard, an Android-only app that selects multiple frames from a video and creates a comic-book-like layout, and the embarrassingly-named Selfissimo, which automatically captures selfies when you pose in front of your iOS or Android device. You love your iPhone X. You love your wallpaper. You hate the notch. We get it — and so does Notcho. This new app lets you create custom wallpaper that mimics the curves of the X's screen while drowning the notch in a sea of black. It comes with a library of images, in case you don't want to supply your own, and will let you preview your choice before exporting. A collaboration between Steven Soderbergh and HBO, Mosaic employs branching narratives to provide a new twist on TV-watching. In the first episode, you're introduced to author Olivia Lake (played by Sharon Stone), and afterward, the 7.5-hour story breaks into different perspectives. You can choose to watch all of them before moving on, or instead follow the storyline straight to the end. Unlocked along the way are additional documents, recordings, and video clips that help add to the story, and you can always go back to watch episodes you skipped over once you're done. The Mosaic app is currently available for iOS and Apple TV, with an Android version to follow, and a Soderbergh-edited, six-hour version of the series will air on HBO January 22. A 911 Spyder isn't the most practical vehicle, but the stuff-hauling Macan lacks the same exhilaration. For those that don't want to purchase both, there's Porsche Passport. 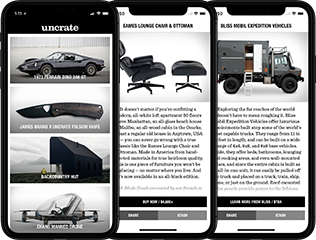 This new subscription service gives you on-demand, app-based access to a fleet of Stuttgart's vehicles. Need to make a splash? Book a 911. Hauling your boat to the marina for the weekend? Grab a Cayenne. Taking a relaxing, open-air drive into the country? The Boxster is ideal. Everything from insurance to roadside assistance is included — you just need to pick up the gas. The base "Launch" plan includes access to various Cayman, Boxster, Macan, and Cayenne models, while the more exclusive "Accelerate" plan adds more powerful models as well as 911 and Panamera options to the list. Launching exclusively for approved members in the Atlanta metro area.